The federal government has re-affirmed its commitment towards the eradication of measles in Nigeria by year 2020. 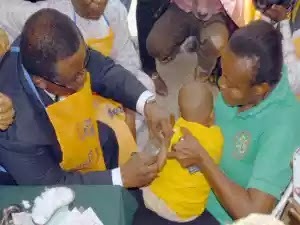 The Minister of Health, Professor Isaac Adewole, made this statement in Friday in Abuja during the flag –off of National Measles follow –up campaign. The World Health Assembly had declared that there was need for global efforts to be intensified to reduce these mortality figures in response to this challenge. Prof. Adewole emphasised that measles vaccination have played a key role in reducing child mortality and in achieving progress towards attainment of Millennium Development Goal 4. He also stressed that the 2015 National Measles Follow-up is to be implemented in northern clusters from 21st -25th November 2015, while the southern clusters are scheduled to take off from 28th January – 1st February 2016. He also said that the 2015 campaign is targeting over 39 million children 9-59 months of age in the country. He informed that the campaign is supported by Federal Government, Gavi and other developmental Partners while appreciating President Muhammadu Buhari for his commitment for programmes in the health sector. In his remark, the Minister of the Federal Capital Territory (FCT) Mohammed Bello, represented by the Acting Secretary of Health, FCT, Mrs. Odey Achu, said that the campaign is aimed at administering a booster dose to children already vaccinated and as an opportunity for reaching out to ‘’ missed children’ ’that is children that ought to have been vaccinated in the earlier rounds.